Using wpDiscuz custom form builder you can add custom fields in comment form. 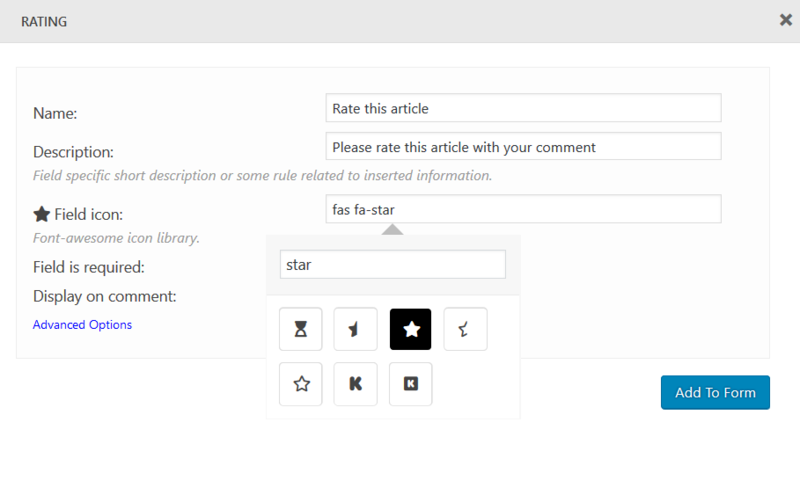 Follow to this instruction steps to add a Rating Stars field in comment form. Navigate to Dashboard > Comments > Forms admin page, edit the comment form you use. Click on the [+] button of the column you want to add a Rating Field (for example in the right column). Click the Rating Field button. Fill the field options and click the [Add to Form] button. By default the rating icons are set “stars”. You can change it to any Font Awesome icon using the icon search field and icon picker tool. Drag the new field and drop to wherever you want (we put it on the top of the right column) and click the top right [Update Form] button to save it. Once all steps are finished, delete all caches and find the new field in comment form on website front-end.